The rear seats are each fitted with a three-point seat belt, with force limiter and, for the outer seats, an effort limiter. Pull the strap, then insert the tongue in the buckle. Check that the seat belt is fastened correctly by pulling the strap. Press the red button on the buckle. Guide the seat belt as it reels in. On the outer seat belts, raise the bar to the top of the backrest to prevent the tongue from knocking against the side trim. instrument panel when one or more rear passengers unfasten their seat belt. From approximately 12 mph (20 km/h), this warning lamp flashes for two minutes accompanied by an audible signal of increasing volume. Once these two minutes have elapsed, this warning lamp remains on until the one or more rear passengers fasten their seat belt. The driver must ensure that passengers use the seat belts correctly and that they are all restrained securely before setting off. Wherever you are seated in the vehicle, always fasten your seat belt, even for short journeys. Do not interchange the seat belt buckles as they will not fulfil their role fully. The seat belts are fitted with an inertia reel permitting automatic adjustment of the length of the strap to your size. The seat belt is stowed automatically when not in use. Before and after use, ensure that the seat belt is reeled in correctly. The lower part of the strap must be positioned as low as possible on the pelvis. The upper part must be positioned in the hollow of the shoulder. The inertia reels are fitted with an automatic locking device which comes into operation in the event of a collision, emergency braking or if the vehicle rolls over. You can release the device by pulling firmly on the strap and releasing it so that it reels in slightly. - be tightened as close to the body as possible, - be pulled in front of you with a smooth movement, checking that it does not twist, - be used to restrain only one person, - not bear any trace of cuts or fraying, - not be converted or modified to avoid affecting its performance. In accordance with current safety regulations, for all repairs on your vehicle, go to a qualified workshop with the skills and equipment needed, which a PEUGEOT dealer is able to provide. Have your seat belts checked regularly by a PEUGEOT dealer or a qualified workshop, particularly if the straps show signs of damage. Clean the seat belt straps with soapy water or a textile cleaning product, sold by PEUGEOT dealers. 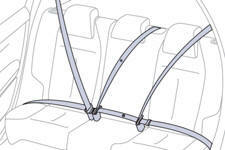 After folding or moving a seat or rear bench seat, ensure that the seat belt is positioned and reeled in correctly. Use a suitable child seat if the passenger is less than 12 years old or shorter than one and a half metres. Never use the same seat belt to secure more than one person. Never allow a child to travel on your lap. Depending on the nature and seriousness of the impact , the pretensioning device may be deployed before and independently of the airbags. Deployment of the pretensioners is accompanied by a slight discharge of harmless smoke and a noise, due to the activation of the pyrotechnic cartridge incorporated in the system. In all cases, the airbag warning lamp comes on. Following an impact, have the seat belts system checked, and if necessary replaced, by a PEUGEOT dealer or a qualified workshop.